Pusey was born in Council, Bluffs, Iowa and studied art at Northwestern and Yale before going abroad. He established a reputation in Paris, Spain and North Africa before returning to Omaha in 1933. Pusey did several murals including ones in the old Chieftain Hotel in Council Bluffs and in a Cedar Rapids, Iowa hotel as well as one at Iowa State University and Des Moines, Iowa Library. During this time he worked with Grant Wood in Stone City, Iowa supervising W.P.A. artists. He later went to California where he worked on sets for Universal Pictures as an assistant art director. 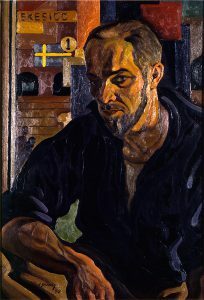 In 1957, Pusey became Artist-in-Residence at Dickinson College in Carlisle, Pa. where he remained until retirement.